Small home installations seem to be getting easier with each passing year as the technology that powers smart devices improves. Unfortunately, problems still happen, as the following examples show. Back in 2009, Raul Rojas become one of the first in Germany to operate a smart home. Nearly everything in the computer science professor’s house could be turned on and off from afar including the lights, music, television, and heating/cooling system. For good measure, Rojas even had robots How to Get a Smart Home Like in Mr Robot How to Get a Smart Home Like in Mr Robot Let's take a look a look at the smart home hardware featured scene-by-scene in a Mr. Robot tv episode, and see what we can figure out. Read More that vacuumed, patrolled the house, and mowed the grass. Four years after Rojas had opened his smart home to the local media, the entire house went offline, as appliances stopped working, the heating system went awry, and those robots stopped dead in their tracks. The reason? A light fixture burned out, which caused a denial of service (DoS) attack What Is a DDoS Attack? [MakeUseOf Explains] What Is a DDoS Attack? [MakeUseOf Explains] The term DDoS whistles past whenever cyber-activism rears up its head en-masse. These kind of attacks make international headlines because of multiple reasons. The issues that jumpstart those DDoS attacks are often controversial or highly... Read More . Our recommendation: Don’t replace everything in your home with smart products. Of those smart products you do have, make sure you’re always using the latest firmware provided. Most firmware updates come through app updates on iOS and Android. As cyber crime has grown, biometrics 6 Reasons Why Biometrics Are NOT the Way of the Future 6 Reasons Why Biometrics Are NOT the Way of the Future Biometrics have often been seen as the "future" of personal identification, but there are many reasons why that may never actually come to pass. Read More , two-factor authentication Lock Down These Services Now With Two-Factor Authentication Lock Down These Services Now With Two-Factor Authentication Two-factor authentication is the smart way to protect your online accounts. Let's take a look at few of the services you can lock-down with better security. Read More , and single sign-on have become standard security procedures for many. Unfortunately, it wasn’t that long ago that some smart devices came with a very dumb feature — no password required. Back in 2013, a Forbes reporter found that her Insteon connected home system was able to remotely control devices in many of her neighbor’s homes. The issue: Though “strongly advised” in the instruction manual, older Insteon systems didn’t require users to add a username and password to add remote access. Because of this, the unsecured systems were accessible to anyone nearby who owned a similar system. Insteon now requires a secure login on all of the company’s smart products. Our recommendation: Most current-generation smart devices now require authentication. For added peace of mind, change logins on a regular basis. One should replace smoke detector batteries at the beginning and end of Daylight Saving Time. Change the security settings on your smart devices at the same time. The Nest Thermostat was one of the first mainstream smart home devices 13 Things You Didn't Know You Could Do With a Nest Thermostat 13 Things You Didn't Know You Could Do With a Nest Thermostat You may be surprised just how many little tricks you can accomplish with your new Nest thermostat! Read More when it launched in 2011. The device became so popular that the company behind it, Nest Labs, was purchased by Google in 2015. Unlike traditional thermostats, the Wi-Fi-enabled Nest uses built-in sensors and smartphone tracking to adjust heating and cooling depending on whether someone is home. In early January, Nest owners awoke to find that their much loved smart device had turned off unexpectedly, leaving millions of users in the cold. As Google admitted later, a software bug had caused the device’s battery to drain. A software update fixed the problem. Our recommendation: No matter how smart they are, smart devices still require power to function. Have a backup plan if the power turns off, regardless of the reason. And again, don’t rely on the smart devices exclusively. The culprit wasn’t a DoS attack or an authentication issue. It wasn’t even a software bug. Instead, a “misconfiguration” of a security measure Wink had previously implemented caused the outage. In other words, it was human error. Smart devices rely on people to work properly, both those who use the gadgets in their home and those who manage the technology on the outside. In Wink’s case, they admitted to their mistake and resolved the issue, just as you would expect from any company. The bottom line: Expect something to go wrong with your smart device. When a problem does occur, see how the company behind the product responds. Did they fix the issue quickly and professionally or were they unresponsive? How they respond tells you a lot about the company and their products. The iPhone remains the single most popular smartphone in the world, nearly 10 years after Apple announced the first model in January 2007. Despite the iPhone’s longevity, software hiccups still occur occasionally, as they do for all smart devices. The following are some other ways your smart device could go haywire and what you should do when these issues occur. Your device is offline. Smart devices are smart for one primary reason: they connect to the internet. When that connection goes offline, your device could become an expensive paperweight. In these moments, restart your device. Better yet, reset your home’s Wi-Fi connection 4 Reasons Why Your Wi-Fi Is So Slow (And How to Fix Them) 4 Reasons Why Your Wi-Fi Is So Slow (And How to Fix Them) Suffering from slow Wi-Fi? These four issues can slow down your network. Here's how to resolve them to get speedy again. Read More . In most cases, either of these reboots will get your device back online. Pairing issues. When you buy a new smart device, you’ll be asked to pair it with your smartphone. Keep those directions handy. For whatever the reason, those pairings sometimes disappear, requiring a reset. Syncing. When your smart device works correctly, data automatically syncs to your smartphone. When syncing stops, first reboot your phone and see if the problem has resolved itself. If not, restart the device too. Still nothing? Restart both devices at the same time. Something else. Smart devices don’t need rest time like humans do. Even so, some issues can be resolved just by turning your devices off for a short period. Smart devices are great — until they stop working. Anticipating possible problems and knowing what to do when they occur is important. 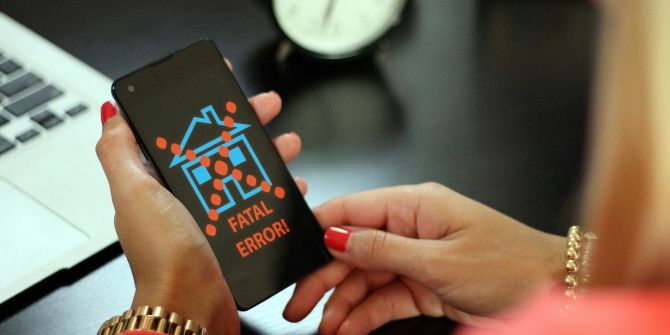 Have you ever experienced any smart device “fails”? Share your experiences with us in the comments section below! Look for smart devices that also include local control and not just through your wifi only. My ancient X10 will function just fine if the internet or my Wifi fails totally. It can be operated over the internet/Wifi via an app, but everything is stored locally in a hub. The X10 works even if the computer fails. Then if the X10 hub fails, most devices will still function using local X10 control. And if the local controller fails the manual switch will still be able to turn things on and off.